Review: Remember / It's Just Movies Review: "Remember"
Zev Guttman is a man on a mission, but suffering such severe dementia at an advanced age he can hardly remember what it is. Guided by a written letter, he relies on those around him to refresh his memory. The memories are those of his family killed by the Nazi SS in the death camps of WWII and the identity of the man responsible. His disappearance from the retirement home causes great concern by his son Charles. The facility administrator is dismissive. “They seldom go very far.” How wrong can one man be? In fact, the barely mobile and barley conscious Zev finds his way across the entire length of America in search of revenge. 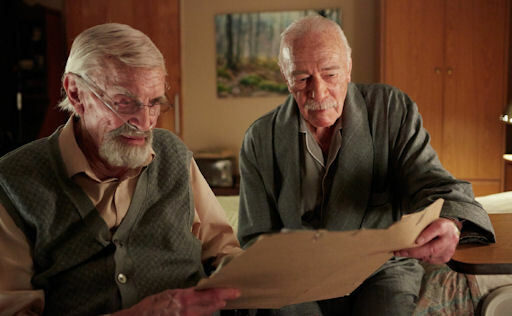 His closest friend and fellow death camp survivor, Max (Martin Landau), has provided him with the locations of four men, each one with the same assumed name. Each one may be the Auschwitz guard responsible for the deaths. Zev must confront each one and rely on indelible, horrible memories 70 years previous to prove the one he is to kill. This well-crafted screenplay, penned by Benjamin August, plays Zev against himself, his nightmarish memories and his seemingly insurmountable mental challenges. The viewer is never sure that Zev’s basically kind nature will allow him to be a murderer, even if he proves capable of finding the right person. Children feature prominently in Zev’s journey, befriending and helping him at key junctures. This is a key element in the unfolding of the man’s inner thoughts. The children provide a strong sense of innocence contrasted with Zev’s loss of faith. As his journey progresses there are mistakes, near misses, stumbles and doubts. Even so, somehow, in one case with a child reading him parts of the letter, he moves forward. In the audience we feel his weight as if it were on our shoulders. Director Atom Egoyan does a masterful job pacing the movie. The closer Zev gets to his target, or a person who may be his target, the farther away his mind seems to travel. His love of the piano is rekindled the closer he gets to the end of his journey. He is walking a fine line between turning back and letting bygones be bygones, and completing the dreadful pact he made with Max. In the background, his frantic son (played by Henry Czerny), becomes increasingly disturbed, feeling that something is terribly wrong, and getting worse by the minute. Having mostly ignored his father for years, Henry is becoming closer to him than ever before. As Zev gets closer to his target, his son gets closer to Zev, and to a truth he will wish he never knew. 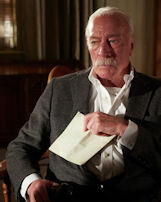 “Remember” features a super performance by Christopher Plummer as Zev, who drives the film from start to finish, and great supporting work by all four Rudy Kurlanders, including Bruno Ganz and Jürgen Prochnow, and the son of one, played to the hilt by Dean Norris (Walter’s DEA brother-in-law in the blockbuster “Breaking Bad” series).